A 35-year-old man shot and killed by police, who allegedly tried to break into a home in west suburban Lisle, was identified over the weekend. LISLE, Ill. (WLS) -- A 35-year-old man shot and killed by police, who allegedly tried to break into a home in west suburban Lisle, was identified as Anthony Aguilar, of Lisle, by the DuPage County coroner's office. Police received a call from a 59-year-old woman around 5:15 a.m. Saturday. She said someone was trying to force their way into her home in the 4400-block of Yender Avenue. The woman, who lives alone, said she woke to loud footsteps on her front porch. She told police someone violently kicked the front door, trying to break in. She said the person moved to the back of the house and kicked the back door. The woman barricaded herself inside the bathroom. Police arrived to find Aguilar armed with a weapon. An officer tried to use a stun gun on him, which had no effect. Another officer shot him. He was taken to Good Samaritan Hospital in Downers Grove, where he later died. An autopsy performed Sunday showed Aguilar died of a single gunshot to his lower right chest. Toxicology results are pending. Three police officers were treated at Edward Hospital and later released. The 59-year-old woman was not injured. Police she did not know Aguilar and that the incident appeared to be random. 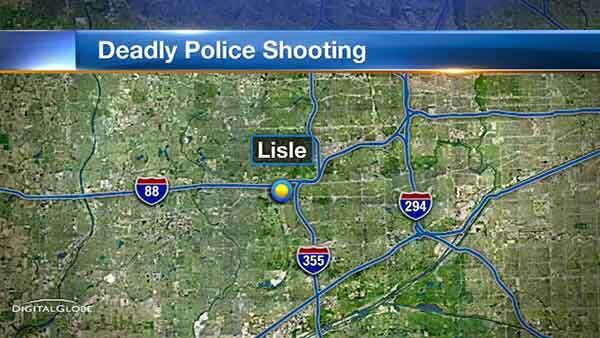 Lisle police said the officer who shot Aguilar had been with the department for three years. The other two officers involved in the shooting were with the department for nine and 19 years.